A quick note card! I love these cateye glasses. I put a layer of bright pink under the shimmery green. Supplies: Stamp – My Favorite Things, paper – Neenah Classic Crest Solar White, Pop Tone Razzle Berry, Shine Lime Satin, ink – VersaFine Onyx Black, die – My Favorite Things, embossing powder – Ranger Liquid Platinum, twine – source unknown (sorry, it was the last bit, I threw out the packaging). Categories: card, encouragement, I love you, note | Tags: card, My Favorite Things, Neenah, Pop-Tone, Ranger, Shine, Tsukineko, VersaFine | Permalink. Aww… WHAT FUN!! 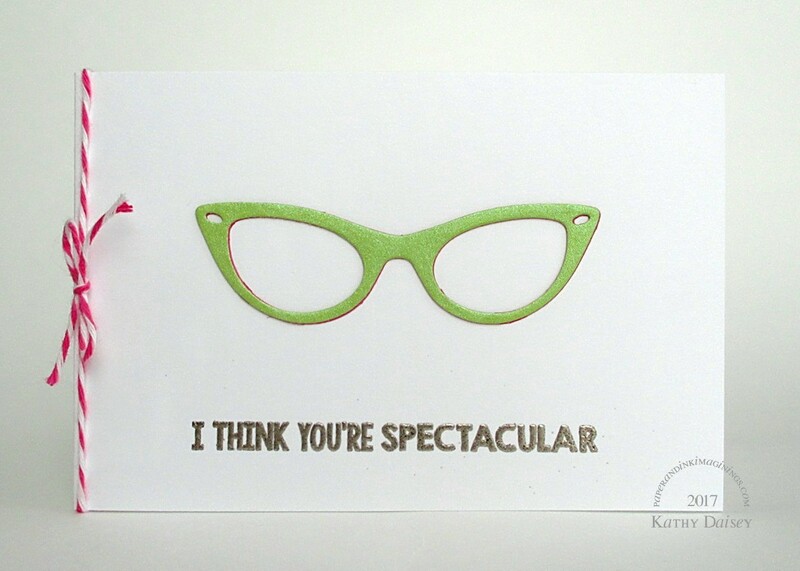 Love the card, adore the glasses. Ooh I love them too! I like the pop of pink behind as well. Beautifully simple, but yes, spectacular!